When you see a Nanday Conure parrot for sale, consider the pros and cons carefully. There are many benefits to owning one of these vibrant beauties, but they require a measure of training and upkeep. They are an affectionate breed of pet parrots, which socialize with other birds and humans remarkably well. They learn human speech relatively easily, and are quite intelligent. 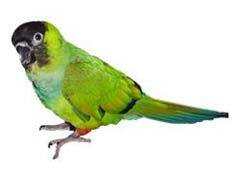 The Nanday Conure, however, requires a very large cage for its small size and screeches loudly. An untrained Nanday Conure parrot can be very difficult to control. What many may also not know is that the Nanday Conure diet is poorly supported by commercial seed alone. In the wild, the Nanday Conure diet consists mostly of grass seeds, cactus, flowers, nuts, insects, and berries. Thus, replicating the Nanday Conure diet at home requires much more than bags of seed, and improper feeding can lead to health problems and behavior changes. The best Nanday Conure diet should have a wide variety of fresh food. They enjoy dark-orange colored fruits, pomegranates, dried grapes, or diced apples. A mix of green or orange vegetables also provides them with needed nutrients, especially ones like broccoli. The occasional meal worm, cheese, or egg thrown in for protein will please the Conure as well. As will all birds, never feed your Nanday Conure chocolate or avocados—these are toxic to birds. Always replace your bird’s fresh food at the end of every day to avoid spoilage. With the proper diet, your Nanday Conure will remain active, healthy, and happy for a long time to come!